Hairstyles vary in terms of complexity, isn’t it? Some women refuse to incorporate complex hairstyles as they are difficult to maintain. This can be frustrating for women with limited personal time every morning. This shouldn’t bar you from looking and feeling good. There are numerous top notch low maintenance haircuts you can incorporate for your busy schedule. Check out the list below and choose haircuts that meet your set expectations. This is one of the easy attain and maintain hairstyle. Additionally, anyone can incorporate this hairstyle, provided you have long hair. Long promo hairstyle is characterized by hair being black on your mid head hair and the rest attaining the blonde look. Proceed and draw a line to separate your mid head and fringe hair into two parts. A section of it should be combed straight towards the left and the other one rest towards the right side of the head. As the name suggests, gorgeous hairstyle is one of the latest easy to maintain haircuts. Hair should rest on both sides of your shoulders and should be evenly trimmed. A large fraction of your mid head and fringe hair should be combed towards the right side of the head, whereas the rest should be sleeked towards the left side of the head. Above all, your stylist should systematically layer your hair to give it a marvelous look. Trendy gorgeous hairstyle suits any event. This top notch hairstyle is characterized by a section of your hair being black and the rest being blonde. There should be a line that separates your left sideways hair from the rest of your front view hair. Your left sideways hair should stretch up to the neck region. Your mid head and fringe hair should conjoin with your right sideways hair before being combed straight towards the right side of the head. Additionally, give your sideways hair a curly-wavy look. Check out this marvelous hairstyle if you are looking something simple for your hair. Balayage black-brown hairstyle is easy to set and maintain. It is characterized by a deep line that divides your front view hair into two parts. One part should be sleeked right and the other one towards the left side of the head. The different layers of black and brown colors should be visible on each side of the head. Give hair on each side of the head a curly-wavy look. This hairstyle is designed for women who are looking for an easy to attain casual hairstyle. Mid Apart Ombre hairstyle can also be converted into an official look in a matter of minutes. As the name suggests, this low maintenance hairstyle is characterized by a line that divides your fringe hair and mid head hair into two parts. Thereafter, hair on should be combed straight on both sides of the head depending on its position on the head. It is definitely worth checking out. Anyone can accustom this hairstyle regardless of your type of hair. Short wedding haircut is both flexible and an easy to maintain hairstyle. It emphasizes that your hair remains within your neck region. Above all, your side head hair on both sides of the head should attain a curly-wavy look. There should be a line on the mid part of your head to determine which direction your hair should face when combed. Give your side head hair a curly-wavy look to enhance its looks. Layered hairstyles are easy to maintain when compared to other hairstyles. This is one of the reasons women are encouraged to check out this marvelous hairstyle. Vintage layered hairstyle is characterized by all your hair being divided into numerous layers. This statement also applies to hair on the back of your head. The layered look throughout the head is what makes vintage layered hairstyle easy to maintain. Above all, your hair should remain within the neck region and should be even on both sides of the head. This hairstyle retrieved its name from its uniform look throughout the head. Hair on both sides of the head should be equal in terms of length. A large fraction of your mid head and fringe hair should conjoin with your right sideways hair before being combed right. Consequently, your remaining front view hair should be combed towards the left side of the head. Traces of black color should be visible on your blonde hair. As the name suggests, this hairstyle is limited for women with long hair. Additionally, it focuses on giving you a highlight look throughout your head. Long highlight hairstyle deserves to be listed among the low maintenance haircuts as it doesn’t entail any plaiting. Simply conjoin your fringe hair, mid head hair and your right sideways hair together. Afterwards, sleek them towards the right side of the head. The rest of your front view hair should rest behind your left ear. Messy layered hairstyle focuses on giving your hair both a messy and layered look throughout the head. This hairstyle is characterized by your side head hair being combed straight on both sides of the head. You are also encouraged to give your side head hair wavy look on both sides up to its edges. Your fringe hair and mid head hair on both sides should be given a layered look before being sleeked towards the left side of the head. Check out this hairstyle if you love masculine hairstyles with a feminine twist. Short fade out hairstyle is characterized by a lot of hair on your mid head, which slowly fades out on both sides of the head. Hair on the mid head mostly comprises your fringe and mid head hair. You are free to comb it in any direction, provided it stays within your hairline. Finally, you side head hair should be systematically trimmed to give the fade out look. Round face long hairstyle encourages the incorporation of blonde color throughout the head. However, you can choose whichever color that fulfills your needs. Start off by blow drying your hair to give it a soft texture. Afterwards, draw a line from your hairline deep into your mid head. This line should divide your fringe and mid head hair into two main parts. Each section should be combed straight towards its respective direction. You should definitely check out this low maintenance hairstyle. The name speaks for itself. This low maintenance hairstyle focuses on giving you a natural look throughout your head. Consequently, any woman can adopt this hairstyle regardless of her hair type. Simply comb hair on the back and sideways straight. Afterwards, decide which section of your fringe and mid head hair should be sleeked either towards the right or the left side of the head. Natural look hairstyle is very flexible and is suitable for any event that comes your way. Women are encouraged to give their hair some breathing space, especially during summer. This marvelous gives your hair enough breathing space. Above all, it is very easy to maintain when compared to other hairstyles. Your hair should systematically attain a blend of black and highlight color at different points on your head. That’s not all; your hair should not stretch past the neck region. There should be a line on your mid head that decides which direction your hair should be combed facing. Draw a line to separate your right sideways hair from the rest of your front view hair. Proceed and sleek your right sideways hair straight towards your right ear. The rest of your front view hair should rest on the left side of the head. That is your fringe hair, left sideways hair and your mid head hair. Vintage fine haircut encourages women to maintain their hair length within their neck region. Lastly, this hairstyle suits any event. As the name suggests, most of your head hair should rest on the left side of the head. Consequently, your hair should attain a blend of black, highlight and blonde color. Your stylist should draw a line that separates your right sideways hair from the rest of your front view hair. Additionally, your right sideways hair should rest behind your right shoulder. Conjoin your fringe hair, mid head hair and left sideways hair together. Afterwards, comb it straight towards the left side of the head. 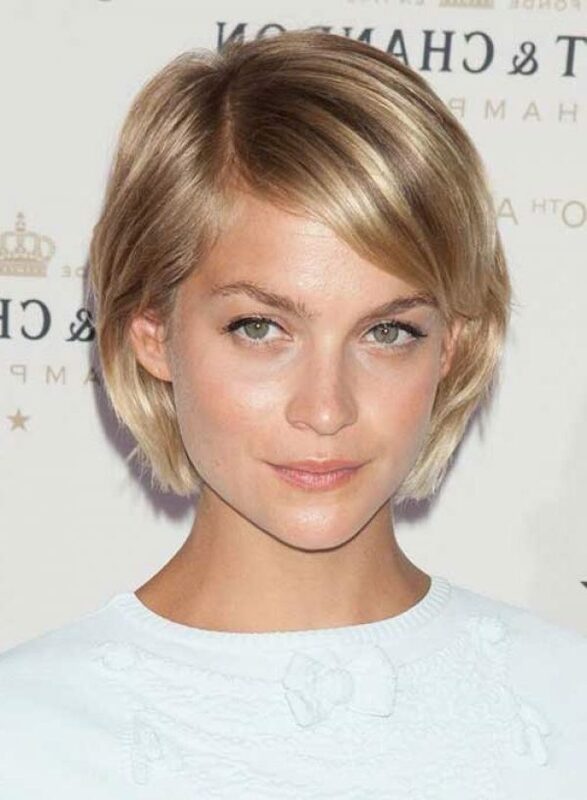 Women should consider this low maintenance haircut if they desire short hair attributed with bangs. Consequently, your hair shouldn’t stretch past the neck region. This is what makes it an easy to maintain hairstyle. Hair on the right side of the head should rest behind your right ear, whereas that on the left side should be combed straight. Additionally, hair on the left side of the head should attain a curly-wavy look. Short bangs hairstyle suits any event. Anyone with long hair can incorporate this hairstyle. Simply start off by blow drying your hair to give it a soft texture. Afterwards, draw a line from your hair line to some point on your mid head. Hair surrounding this line should be black in color and the rest highlight. Your front view hair should be combed either towards the left side of the head or the right. Your entire hair should be combed straight towards its respective direction. Hair on the back of your head should be combed straight and the rest towards the right or the left side of the head. Your side head hair on both sides should attain the curly-wavy look. Consequently, you should incorporate a blend of black, highlight and blonde color on each side of your head. Hair on both sides of the head should be equal in terms of length. Consider this low maintenance haircuts if you want to showcase your fringe hair. Comb you fringe hair and hair on the back of your head straight. Afterwards, conjoin a section of your mid head hair with your left sideways hair and the rest with your right sideways hair. Hair on each side of your head should be combed straight and should stretch up to the neck region. Short wispy bangs hairstyle suits any event, be it official or casual. As the name suggests, most of your hair should be combed straight. This is what makes this top notch hairstyle easy to maintain. Your fringe hair should be sleeked towards the right side of the head and should conjoin with a section of your mid head and right sideways hair. Pixie straight hairstyle suits any event that comes your way. Enhance your looks by blending different colors on some sections of your head. Look no further if you desire hairstyle that gives you the opportunity to showcase you long hair and is easy to maintain. Bangs queen hairstyle is characterized by a line that separates your front view hair into two parts. One part should be combed towards the right side and the other part towards the left side of the head. That’s not all; each side of the head should attain a blend of black and blonde color. This easy to maintain hairstyle is characterized by a blonde look throughout the head. Consequently, your fringe hair should conjoin with your left sideways hair. A large fraction of your mid head hair should be combed towards the left side of the head. Your stylist should ensure hair on both sides of the head is equal in terms of length. Shag poker face hairstyle encourages women to maintain their hair within their neck region. Hair on the right side of your head should be combed in front of your right shoulder, whereas that on the left side of your head should be combed behind your left shoulder. Your front view hair should be divided into two parts through a line. This line gives direction on which side your hair should be combed facing. Above all, you are encouraged to give your hair a wavy-curly look throughout your head. This is one of the few low maintenance hairstyles suits anyone with long hair, regardless of her hair type. Long natural hairstyle is characterized by your front view hair being combed either towards the right or the left side of the head. Your hair should be black up to some point, after which it should adopt the blonde color up to its edges. Hair on both sides of the head should be combed straight. Wavy hairstyle is more about styling. Your stylist should sleek your front view hair either towards the right or the left side of the head. Afterwards, he/she should give your hair on both sides of the head a curly-wavy look. Wavy hairstyle is purely a casual hairstyle but can be customized for official functions. Choose this hairstyle if you want to stand out from your peers. This marvelous low maintenance hairstyle focuses on giving your side head hair on both sides a curly-wavy look. Consequently, your stylist should incorporate a blend of black and highlight color on both sides of the head. It is up to you to decide which fraction of your fringe and mid head hair should sleeked right and which one should be sleeked left. Round face bangs hairstyle is easy to maintain as it entails combing your hair straight. Hair on the right side of your head should be sleeked in front of your right shoulder, whereas the rest of your front view hair should be combed behind your left shoulder. This low maintenance hairstyle is suitable for women with long hair. You are encouraged to give your hair blow dry to enhance its texture. A large section of your fringe and mid head hair should be sleeked towards the right side of the head after conjoining with your right sideways hair. Short layered hairstyles are considered one of the simplest and easy to maintain hairstyles. Pixie cute lady hairstyle is one of these low maintenance hairstyle. This hairstyle is flexible in that you can incorporate any color you deem necessary on your hair. Secondly, pixie cute lady hairstyle suits any event that comes your way. Above all, this marvelous short hairstyle offers a background for incorporation of delicate hairstyles later on. This marvelous hairstyle is characterized by your fringe hair being conjoined with hair on the right side of your head. Above all, hair should remain within your neck region. You are encouraged to give hair on each side of your head a wavy look. Women should consider this hairstyle if they desire a unique look among their peers.